Matter Forms Solid Objects In The Universe. 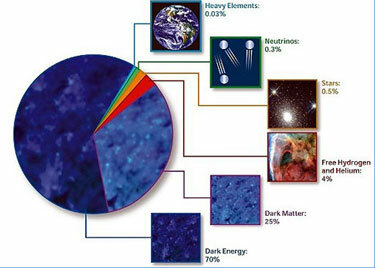 Matter makes up most of the universe. Matter in physics, is commonly defined as the substance of which physical objects are composed, not counting the contribution of various energy or force-fields, which are not usually considered to be matter per se (though they may contribute to the mass of objects). Matter constitutes much of the observable universe, although again, light is not ordinarily considered matter. Unfortunately, for scientific purposes, "matter" is somewhat loosely defined. Matter constitutes much of the observable universe. Colloquially and in Chemistry, matter is easier to define because it is associated with quantitative aspects such as mass. Matter is what ponderable objects are made of, and consists of identifiable chemical substances. These are made of atoms, which are made of protons, neutrons, and electrons. In this way, matter is contrasted with energy. In physics, there is no broad consensus as to an exact definition of matter. Physicists generally do not use the word when precision is needed, prefering instead to speak of the more clearly defined concepts of mass, invariant mass, energy, and particles. A possible definition of matter which at least some physicists use is that matter is everything that is constituted of truly elementary particles called fermions. Fermions are spin-1/2 particles, which are thought to have no substructure. They include the leptons (the best example of which is the familiar electron), and also the quarks, including the up and down quarks of which protons and neutrons are made. Since protons, neutrons and electrons combine to form atoms, the bulk substances which are made of atoms are all "made" of fermionic matter. In this scheme, matter also includes the various high-energy and short-lived baryons (such as delta particles) which are never seen except in physics experiments, and also the mesons. Things which are not matter, would include light (photons) and the other massless gauge bosons, such as gravitons and gluons. Presumably massive gauge bosons such as the W and Z bosons which mediate the weak force would also not be included in "matter." Matter problem with fermion definition: most mass of ordinary objects is not elementary fermions. However, the fermionic (or elementary particulate) definition of matter is not always satisfying when examined closely. In this scheme, elementary massive gauge bosons of the weak force have invariant mass, but are not considered matter because they are not fermions. Furthermore, a number of other long-lived systems also may have mass without being mostly (fermionic) matter, and some of these are more familiar than massive gauge bosons. These include ordinary nucleons such as protons and neutrons. In fact, much of the mass of ordinary matter is not the fermions which it contains. Any kind of energy in a closed system will be associated with a kind of invariant mass, which has weight, inertia, and in general acts exactly like all other forms of matter. For example, when an object is heated, according to modern physics, it gains in weight, and therefore in mass. The contribution of energy to mass of systems holds, even if the particles which contribute the energy have no rest mass, which is mass which would be apparent if they were examined one at a time, at rest. Thus, any two photons which are not moving parallel to each other, taken as a system, have an invariant mass, even though neither of the photons can be examined at rest, or said to have a mass. This type of system mass (see mass in special relativity) is similar to the kinetic energy of two objects in a system where the objects are moving relative to each other, which energy contributes a certain amount to the mass of the system. When the reference frame is chosen in which the momenta of the particles sums to zero, their summed kinetic energy contributes a minimal amount to the mass of the system, and this (minimal) contribution cannot be removed by choice of reference frame, and is over and above the contribution of the sums of the rest energies of the particles themselves (should they have any) to the system. More problematically, as noted above, most of the invariant mass and weight associated with ordinary objects, is not associated with their fermions. A simple example of some fraction of ordinary matter not consisting of fermions, is the packing fraction of matter associated with the binding of mass in nuclei. This mass is composed of nucleonic fields and is not particles like neutrons or protons, yet it contributes up to 0.1% of the mass of hydrogen, as compared with more tightly bound atoms like iron or nickel. The problem becomes more acute when baryons themselves are examined, rather than atomic nuclei. Electrons are relatively light, but so are the quarks that make up the fermionic substructure of protons and neutrons (quarks are less than 1% of the weight of these particles). Therefore, more than 99% of the mass of baryons, or ordinary atoms, and thus ordinary objects, is NOT fermions; rather it is the mass of the systemic kinetic energy of the bound quarks, and the mass of the gluons which hold quarks together. These gluons have no rest mass by themselves (like photons), but even so, they do have energy, and thus contribute mass to systems they are bound into. For all of these reasons, it appears that there is no easy definition of "matter" which includes ordinary kinds of "mass," but would does not include the kind of "trapped energy" which massless particles and their energies of motion can and do show, when they are considered as systems, or when bound into systems. Kinetic energy or light might not seem like "matter", but it must be realized scientifically that most of the mass of a piece of ponderable matter is actually the pure kinetic energy of the quark particles which compose it, as well as the energy of the massless "light-like" gluon particles themselves. Usage note regarding matter and anti-matter. The opposite of anti-matter (e.g. electrons, but not positrons). Both matter as defined in the previous line and anti-matter (e.g. both electrons and positrons). Properties of matter as individual particles. In bulk, matter can exist in several different phases, according to pressure and temperature. A phase is a state of a macroscopic physical system that has relatively uniform chemical composition and physical properties (i.e. density, crystal structure, index of refraction, and so forth). These phases include the three familiar ones - solids, liquids, and gases - as well as plasmas, superfluids, supersolids, Bose-Einstein condensates, fermionic condensates, liquid crystals, strange matter and quark-gluon plasmas. There are also the paramagnetic and ferromagnetic phases of magnetic materials. As conditions change, matter may change from one phase into another. These phenomena are called phase transitions, and their energetics are studied in the field of Thermodynamics. In Particle physics, antimatter is matter that is composed of the antiparticles of those that constitute normal matter. If a particle and its antiparticle come into contact with each other, the two annihilate; that is, they may both be converted into other particles with equal energy in accordance with Einstein's equation E = mc2. These new particles may be high-energy photons (gamma rays) or other particle-antiparticle pairs. The resulting particles are endowed with an amount of kinetic energy equal to the difference between the rest mass of the products of the annihilation and the rest mass of the original particle-antiparticle pair, which is often quite large. Antimatter is not found naturally on Earth, except very briefly and in vanishingly small quantities (as the result of radioactive decay or cosmic rays). This is because antimatter which came to exist on Earth outside the confines of a suitable physics laboratory would almost instantly meet the ordinary matter that Earth is made of, and be annihilated. Antiparticles and some stable antimatter (such as antihydrogen) can be made in miniscule amounts, but not in enough quantity to do more than test a few of its theoretical properties.